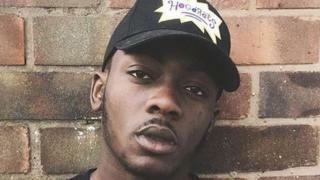 Fidel Glasgow, the son of Mr Staple's daughter Melanie, died after being stabbed in Coventry on 1 September. Mr Staple said the song was dedicated his grandson "and to everyone else who has been affected by violent crimes". The song is a remake of A Message To You Rudy and highlights the "pain and the anger" inflicted on families. Mr Staple said: "It's time we take back some control and teach the youth right from wrong and the consequences of their actions." The ska singer and his wife Christine 'Sugary' Staple collaborated with Dandy Livingstone on the new track. Mrs Staple said: "It's like there's no regard for life now, it's become the norm. "It's in the lyrics, saying put them down, think about you're doing. Kids might be on your plan, who are they going to look up to? "You're walking around with a blade in your hand or you've cut somebody. Think about where you're going with this." In December, Mr Glasgow's mother made a plea for witnesses to come forward as footage showed huge crowds where her son was fatally injured.